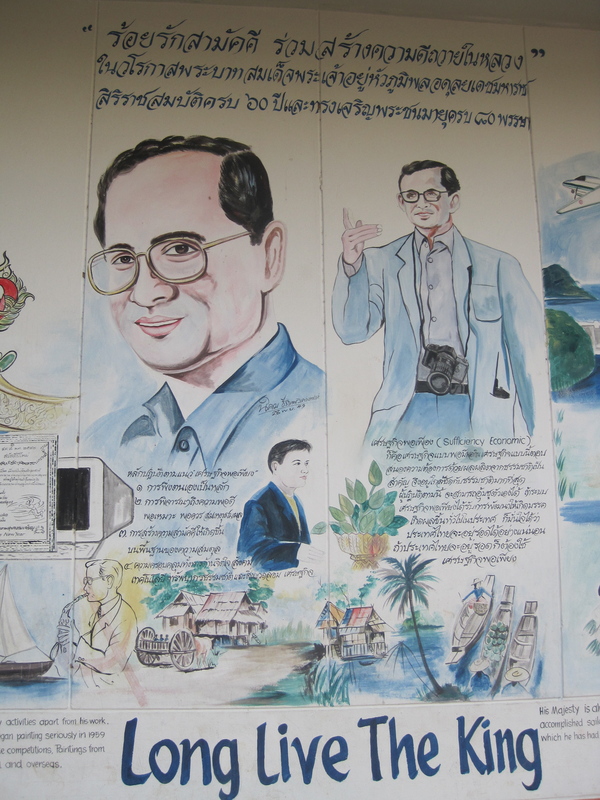 After three days on my own, I would say that I have thoroughly exhausted Nan’s many “attraction places” (as the t-shirts say) and so, at the rather strange request of head teacher Ajarn Prakop, I spent the entire day at school with Jackie. 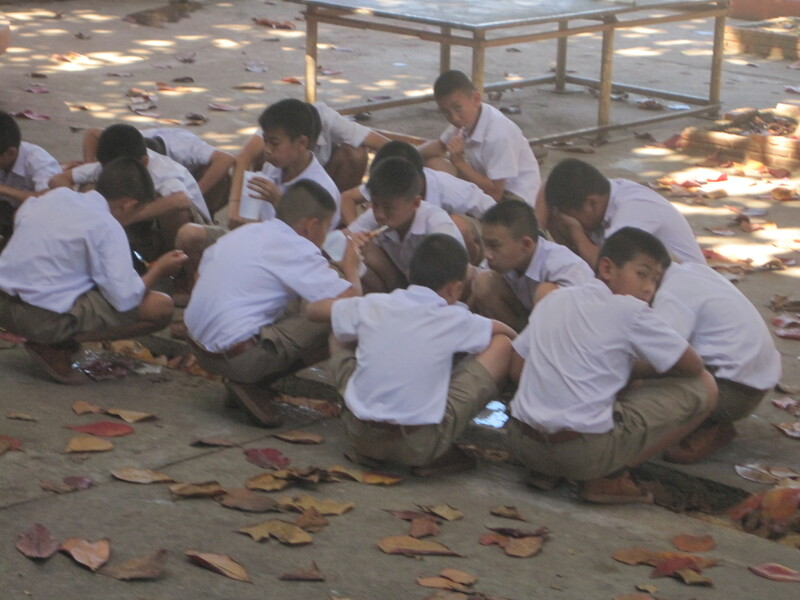 For lack of anything better to do while Jackie was teaching, I jotted down a few disjointed observations about Thai schooling. 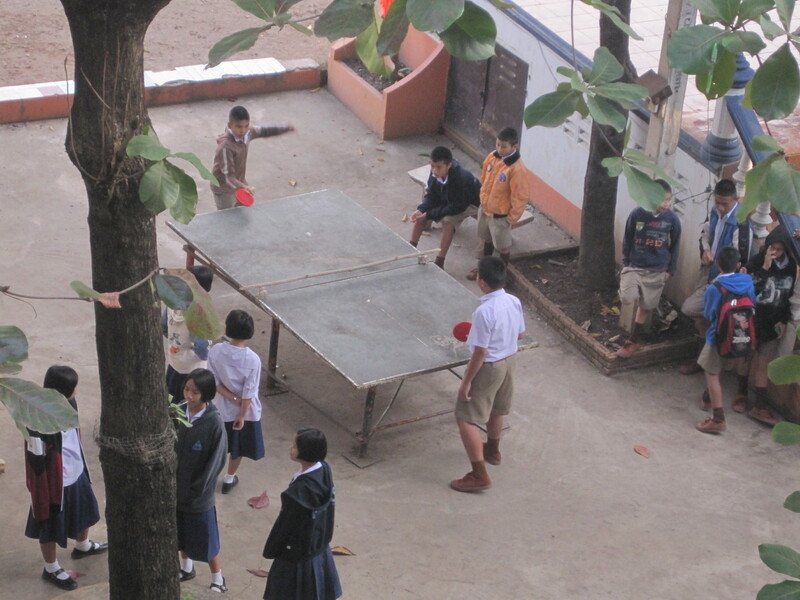 I am always struck by the realization that, in most places in the world, school is and has been really boring. Even visiting restored “Old West” prairie schoolhouses in the U.S., it is pretty apparent that most learning happened via rote memorization and, as a consequence, school must have been completely miserable. In Uganda, with 100 kids packed into one classroom, uni-directional teaching was the only option, but that didn’t change what a raw deal it was for the kids. Here, too, Jackie tells me that a lot of the teaching consists of call-and-response. The school has no hallways or glass windows—everything opens onto the courtyard—so you can hear students speaking in unison all the time. The children’s artwork and activities hung on the walls, though, makes me think it’s not all a drag. Apparently one way the kids show respect for their teachers is with enthusiasm: occasionally, you hear an entire class shouting “hooray” in a way that more fits my ideal of an elementary school than anything I’ve ever actually experienced. The school’s infrastructure feels a bit old and decaying (but who am I to say, I went to school in a converted strip-club without plumbing). The lack of new and nice things, though, seems more than compensated by the pride that teachers and students take in the place. While I was there, some 4th graders’ boundless energy was channeled into a “sweep the entire school and pick up all the fallen leaves” game, which they appeared to seize upon with relish. Oh, and they have boy scouts. When Jackie took me on a tour of the school, a group of boys were outside wearing uniforms that were all to familiar (the trauma is so near…) Like any good group of scouts, they were supposed to be learning the (completely useless) skill of how to lash together sticks of wood, but instead appeared to be beating each other with sticks. Some things, it would seem, are universal. The girls, for their part, get to learn to cook, which is both more useful, less dangerous, and infinitely less fun. 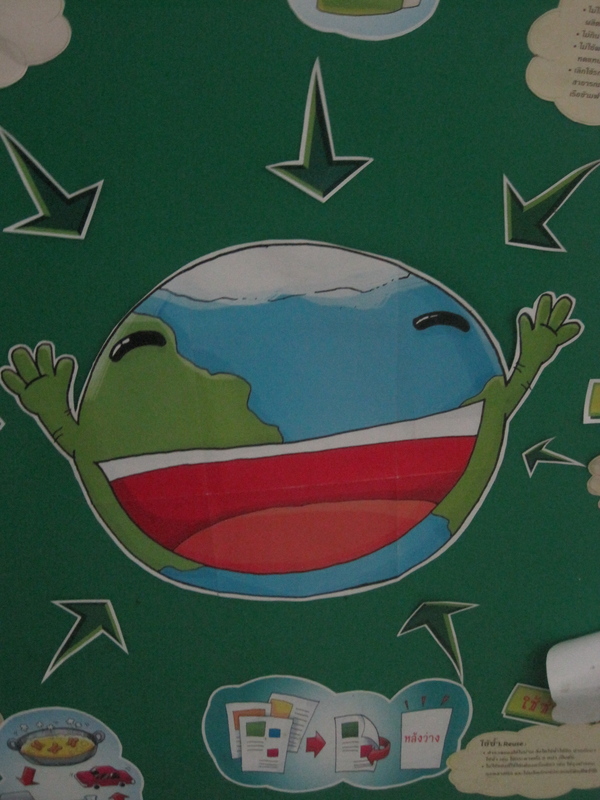 According to this motivational mural, the king is better than you at everything. Education here is definitely intended to be more than just academic. There are all sorts of things around the school promoting patriotism and Buddhism (what am I talking about? Arizona has a law requiring American flags in every classroom). Anyone looking to find evidence of the (exaggerated, charicaturized) Asian culture of hierarchy and obedience need look no further than the frequent school assemblies and “let’s brush our teeth en masse” songs played during recess. But really, what’s wrong with brushing your teeth, especially when your school lets you eat ice cream for breakfast? I really wish I could get ahold of the "let's brush our teeth" song. 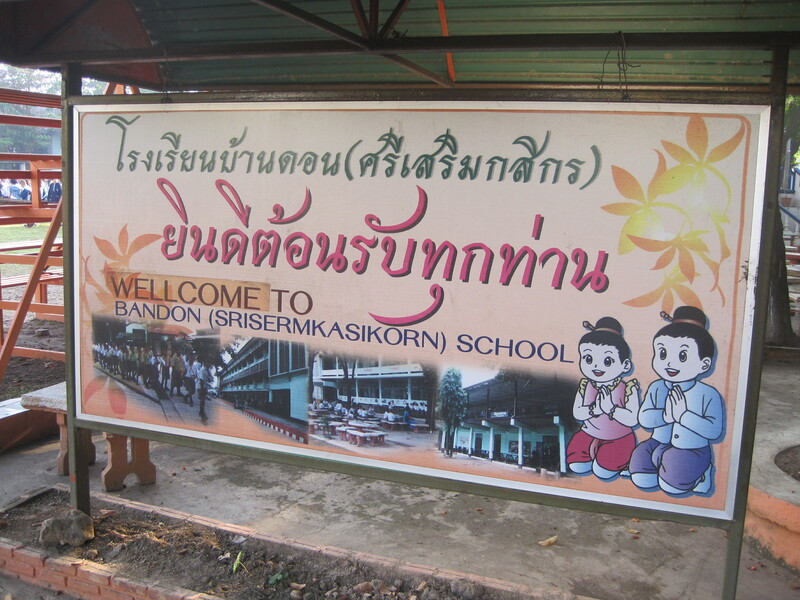 All in all, though, I don’t think I would mind attending the Bandon Srisermkasikorn School. I’ve seen some schools that feel like prisons, and this is not one of them. 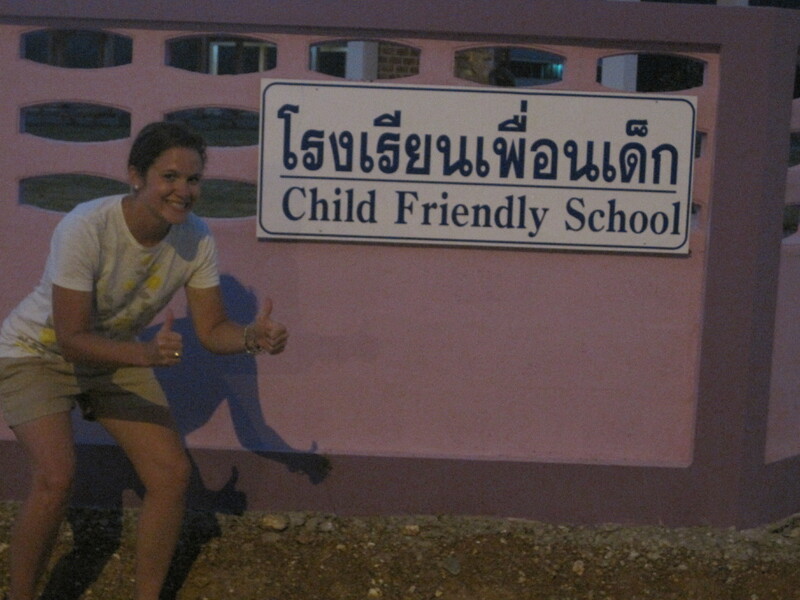 Plus, I hear they have some great English teachers. Thailand ended for me at the bus station, waving goodbye from the furthest back seat of the bus, pressed up against the window while the bus pulled away, grabbing a last look at Jackie. It was a storybook perfect ending to a storybook perfect trip. Delhi remains the worst airport of all time. The bureaucracy really is so senseless that it’s not even worth my time trying to spin it into an amusing anecdote. It is as if someone set out to design the least intelligible airport ever, and succeeded astonishingly. I would mention only that there are currently six people mopping this waiting room (yeah socialism) and the TV appears to be playing a program mocking Islamic terrorism using sock puppets. I remember coming back to Princeton for the first time. It was at the end of fall break my freshman year. I was not happy to be returning; I was leaving behind my best friends in Flagstaff, still in high school, and coming back to a place where I felt truly lost. Still, on the air train at Newark, I genuinely couldn’t travel fast enough: I was excited to be home. I’m leaving behind a lot in Thailand, but, right now, Oxford is the place where I belong, and on the way back, the bus couldn’t go fast enough. So’s Jackie in her picture.